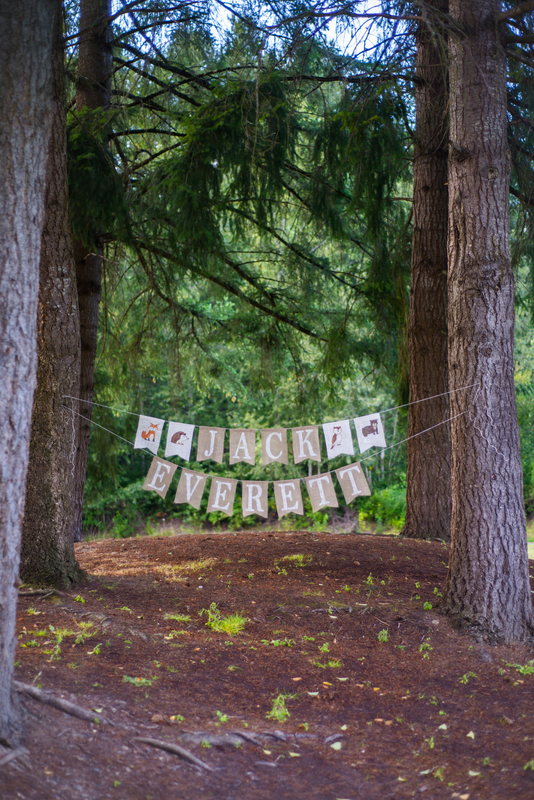 Today, I have a very special name and gender reveal to share with you! If you know me well, you know that I love surprises. I always have, and I’ve always loved being able to surprise others on special occasions or for no reason at all. Turns out, this little baby is taking after mama in that regard! The day of our ultrasound was beautiful and sunny. Benj and I couldn’t stop grinning all morning as we thought about getting to see our squirmy little baby! We got to the clinic early, followed the same tech who had done my 7 week ultrasound down a long hallway, and stepped into the dim sonography room. Baby turned out to be one of the most cooperative ones the tech had had in a while, which made his job much easier. 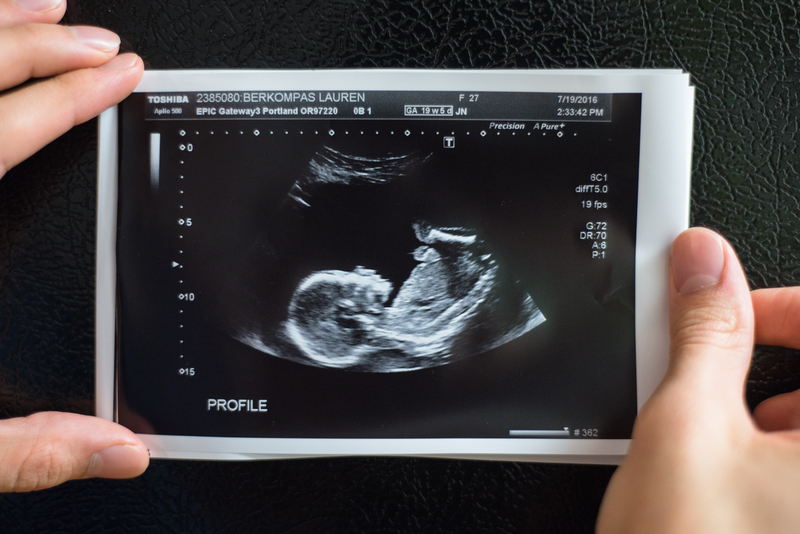 We looked at the baby’s heart, spine, and other organs as the tech pointed out everything along the way. I’m definitely thankful for such an awesome experience. Our tech was great and lighthearted and kept us engaged in the whole process. I told him I thought it was a girl. He asked us what girl and boy names we were considering, and we told him. We had completely settled on our girl name, but there were still two boy names we’d kept tossing back and forth. Since baby was being so helpful at every turn, he was able to get a really clear shot right between baby’s legs. He froze the screen and asked us if we were ready to find out what we were having. We said, “Yes,” smiling all the while, and he started typing on the screen. He laughed and told us that he’d give us $3,000.00 if he was wrong. It’s a good thing baby was being so cooperative or I might have had trouble believing him! By the time the ultrasound was over, I knew which of our two names fit this baby best. Benj and I were on an an emotional high as we walked out of the clinic and back to our car, shocked and giddy. Benj wholeheartedly agreed. He’d loved that name most from the beginning. Even though I’d favored the other name we’d picked out going into the ultrasound, it was so clear to me that this baby is our little Jack Everett. Jack means “God is gracious”, and we couldn’t think of a more fitting name considering how the Lord has worked in our lives the past year. Benj dropped me off at Joann’s before heading back to work so that I could pick out the materials for the bunting we’d planned to make for our gender reveal. I had also wanted this to be a focal point in our baby’s nursery, but figured I would wait until we knew the gender before planning it too carefully. I ended up wandering around the store for 2 hours, just taking my time, exploring my options, and picking out materials. 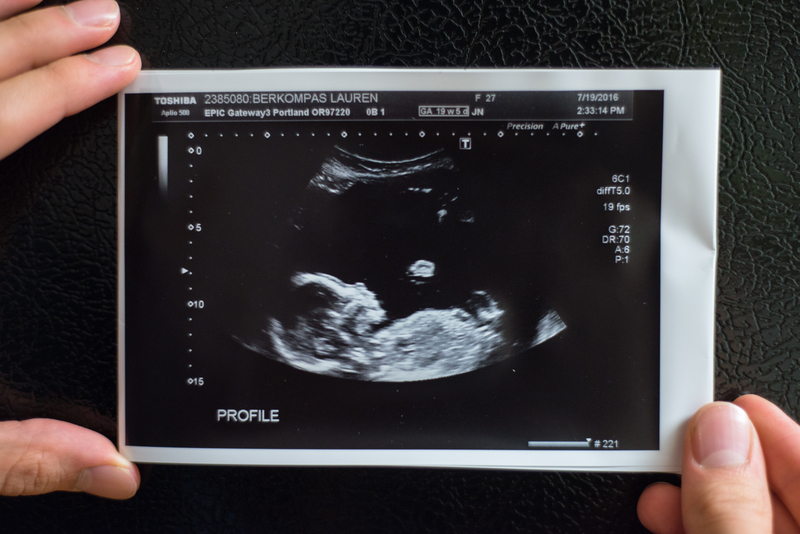 There was so much extra excitement swirling around in my brain now that I knew we were expecting a little boy. This wasn’t because I wouldn’t have been just as excited about a little girl. No, it was because little girl things were what had been occupying my thoughts for the past 4 months! I had everything pink and frilly and feminine on the brain. It was almost like finding out I was pregnant all over again as I began thinking about ALL the little boy things. I settled on brown and cream burlap after looking at lots of options. Then, I picked out 8 inch letter stencils with white paint for the letters and a few more paint colors for the animals. Cream jute twine was perfect for tying it together- no pun intended! First, I created and cut a template for the bunting using a yardstick. Then, I proceeded to cut out the panels of burlap. It was certainly a challenge to work with, but I managed to get them all cut out without losing my mind. Then, I painted on the letters with a sponge brush. 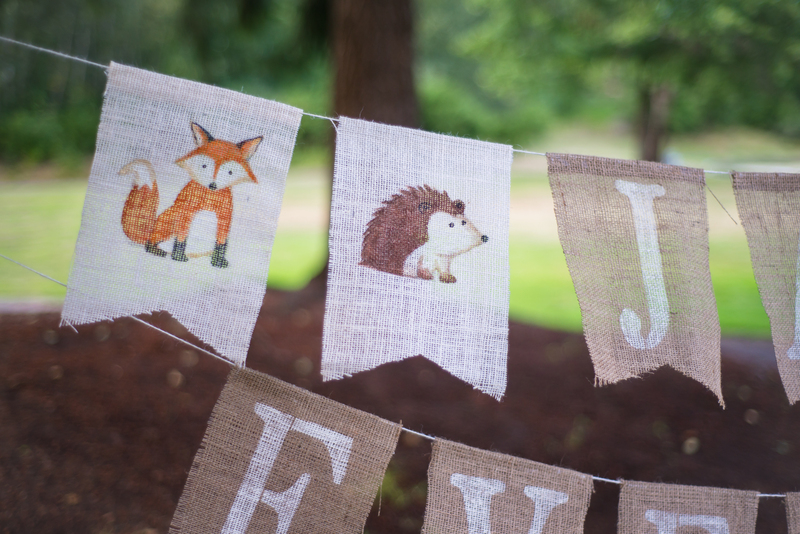 My husband is an incredibly talented artist, so I asked him if he’d like to paint some woodland animals for the bunting. He’s told me that I could commission artwork many times, so I was excited to finally take him up on that offer. Of course, Benj was more than happy to comply! 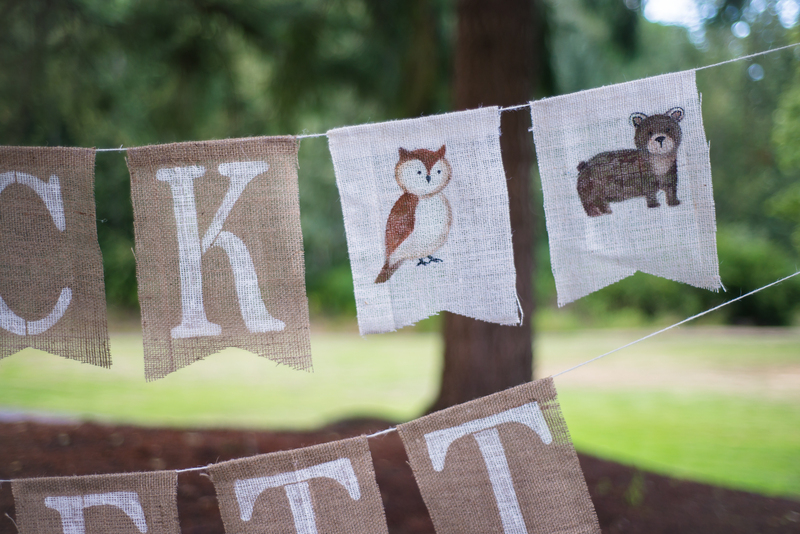 We spent a little time figuring out which animals we wanted on the bunting and which styling would look best. Benj started sketching on a notepad and came up with some animal sketches we were excited about. Benj then sketched the woodland animals onto the burlap before painting them on. That was no easy task! Then he started painting, mixing the paints as he went. These little woodland critters are pretty much the cutest things I’ve ever seen. 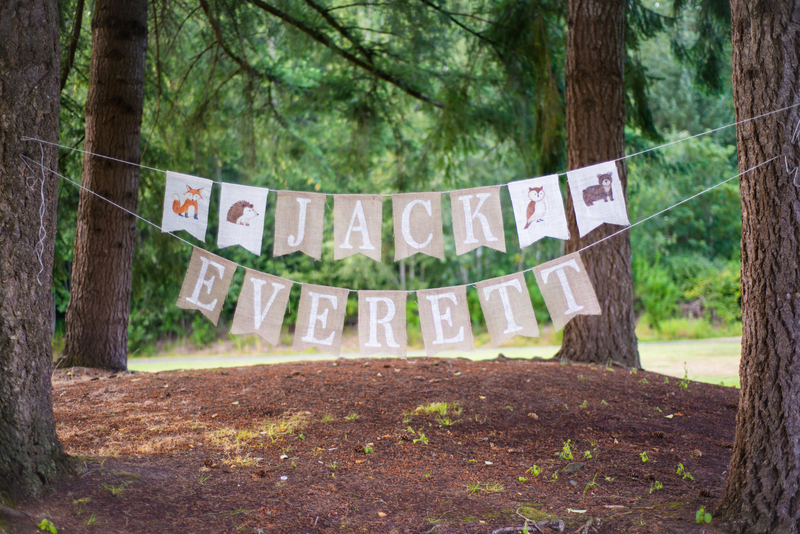 I can’t wait to hang this bunting up in Jack’s nursery! Benj helped me to hot glue all of the panels onto the twine after they were finished. I have to say, it was a lot of work to create, but it’s probably my favorite DIY project I’ve ever managed to complete. I couldn’t have done it without help from my sweet husband, though! We are so thrilled to be welcoming this little guy into our home in just 4 1/2 months or so! And mama is incredibly excited to be able to shop, decorate, knit, and plan finally knowing this baby’s gender! We can’t wait to meet you, Jack. Love this so much! So excited for you both! Congrats on finding out it’s a boy! 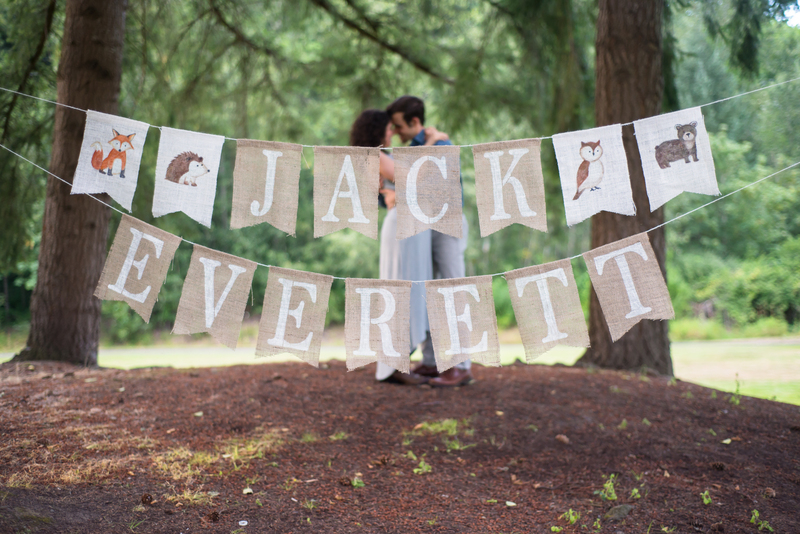 That bunting is so cute and your husband is quite a talented artist. What a special project to create together. SO excited for you all!!!! We love you all! Can’t wait to meet you little Jack! Love it Lauren, So happy for you both you should be very proud of what you have accomplished. God bless you both and with His help, Jack will be one healthy and happy Boy. Love you. Wonderful news! 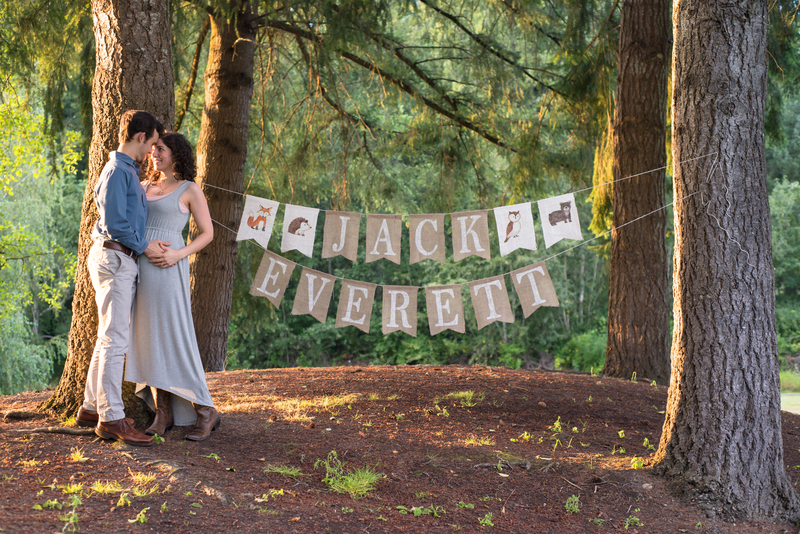 I was right for a change ;) God bless you both and Jack Everett! Following! Congratulation to you both! Praying you are able to enjoy the rest of your pregnancy and that God will give you both the pleasure of leading little Jack to the Lord. And I agree, your husband is quite an artist, those animals are adorable. 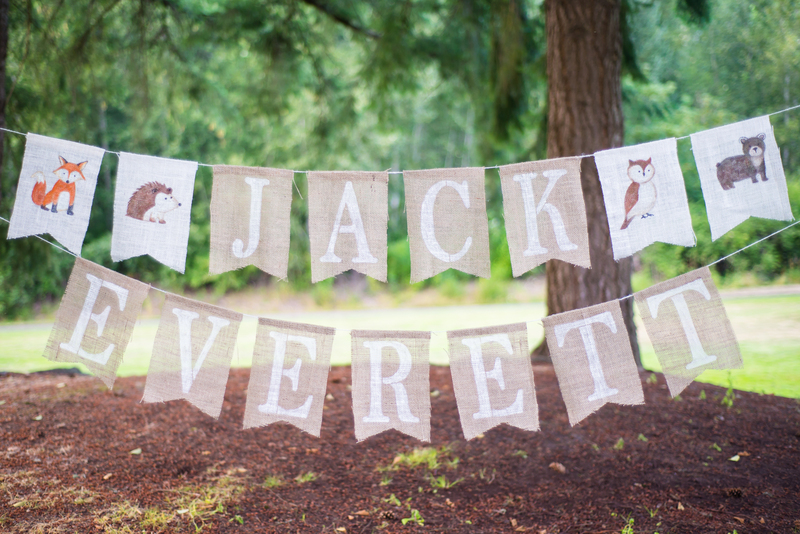 The name Jack was in our running list of boys names too ;) So good choice! I think we’ve settled on a different one though– that is if it is a boy!